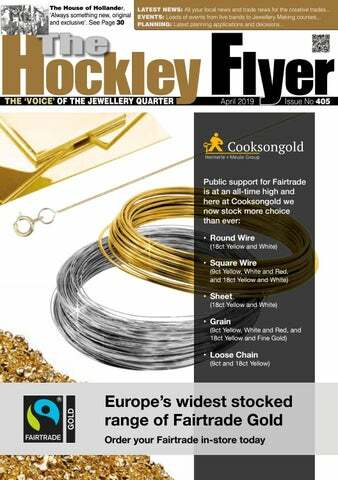 Ludgate Hill: The Hockley Flyer is distributed free of charge around Birmingham’s Jewellery Quarter, being left at various pick-up points. If you would like a copy posted to you personally we also provide a comprehensive subscription service, which costs £9.25 for the next 12 issues. 32 WW2 - From E.P.N.S. to P.I.A. 17 JQ BID partners with First Mile to make Birmingham Green! In the last ten years The Aconia Casting Company has grown considerably. Our new, larger premises accommodates our growing number of new, state-ofthe-art furnaces, casting machines and 3D Printers. Most of our castings are bespoke, using up-to-date CAD software to produce exactly what our customers want, with our up-to-date 3D printers building models to bring your designs to life. H.S.WALSH and Sons have been in business since 1947 supplying tools and equipment to the Horological and Jewellery industries. We pride ourselves on our customer service and at our three showrooms in Hatton Garden, the Birmingham Jewellery Quarter and Head Office in Biggin Hill we really do believe that nothing is too much trouble. zzYellow gold, rose gold, silver, rhodium, and black rhodium. zzScrolls/butterflies, earring posts, hook wires, ball stud beads, and jump rings. zzSoldering, polishing, stamping, laser welding, engraving, barrelling, and cold enamelling. Marie Haddleton and from the Editorial team. THERE IS NO NEED TO MISS AN ISSUE If you have changed address please let us know your old address to update our records, online - its easiest! Trade Talk from around the Jewellery Quarter and more. JQ BID partners with First Mile to make Birmingham Green! lections to twice a day, resulting in the removal of one vehicle from the road daily.” The Jewellery Quarter BID is the first BID in Birmingham to introduce a subsidised recycling scheme, paving the way for First Mile to edge closer to their mission of creating a more sustainable Birmingham! Luke Crane, JQBID Director, said: “The BID includes over 700 commercial units producing waste and refuse. As a business community we have a responsibility to reduce any detrimental impact we may be having on the environment. Working with First Mile provides us a great opportunity to deliver this objective and reduce our carbon footprint as a business collective.” To ensure sign up for businesses is as hassle free as possible, First Mile have introduced a dedicated Recycling Advisor for the Jewellery Quarter, Vinny Madhar. For more information on the scheme, businesses can contact Vinny via email Vinny.madhar@thefirstmile.co.uk or through phone: 07701 315 703.
a new research-centred building at the heart of the Jewellery Quarter. Courses to be delivered at the site include MA Jewellery and Related Products and the School’s newly validated one-year Graduate Diploma Pre-Masters, as well as the MA Luxury Jewellery Management programme. Professor Stephen Bottomley, Head of the School of Jewellery at Birmingham City University, said: “We’re delighted to be building for the future within the historic heart of the Jewellery Quarter. It is a great pleasure to be able to announce growth, investment and support for craft and design in higher education, especially after years that have seen some significant national losses in our specialist subject. This is positive and exciting news for our students and our staff and addresses the high demand from our academic partners across the world while enabling the School of Jewellery to reach to new countries to achieve greater diversity.” The School of Jewellery recently won the prestigious ‘College Trophy’ for the third consecutive year at the Goldsmiths’ Craftsmanship and Design Council Awards in London. Described by English Heritage as a ‘national treasure,’ Birmingham’s Jewellery Quarter is home to more than 500 jewellery firms producing around 40 per cent of British jewellery. TT Charles Green @CharlesG1824 - Creating designs for our luxury #CharlesGreen #lockets. #British #craftsmanship at its finest, beautifully created to last generations. TT TheGoldsmithsCentre @ GsmithsCentre - Our next exhibition celebrates the craft of ‘cutting letters’. Engraving and carving letters has a rich heritage and can be incorporated into lots of objects. The Craft of Cutting Letters' opens 30 April! LOOK AFTER YOUR OWN CLASSIFIEDS Place your advert online directly with PayPal or credit/debit card via PayPal. Visit www.thehockleyflyer.info and look for the classified page. be lab-grown following testing. The customer had secured the stone, believing that the stone was 100% natural” She added: “It’s critical that retailers and buyers are diligent and aware of services which are available to them to help make selling of both kinds of stones clear, safe and consumer friendly. Our trusted Gem Lab can support suppliers, wholesalers, retailers and consumers alike. If ever you are unsure, or your customer demands it, we can be on hand to help.” Senior Gemmologist, Krishna Powar said: “One of our experienced jewellery valuers in SafeGuard had suspicions about a large multistone item and wanted a second, technical confirmation so referred the item through our Gem Lab, the item turned out to be lab-grown. AnchorCert Gem Lab is a great benefit to SafeGuard; shared knowledge and experience means we can provide customers with definitive outcomes on items which are being valued. If detected the difference of the valuation can be significant, based on the gemmological report specifying if a stone is synthetic, natural, treated etc.” In September 2018, De Beers released a screening device called SYNTHdetect. It is specially designed for testing stones in mounted jewellery but can also be used to test loose stones. The Birmingham Assay Office will be launching their SYNTHdetect service in May. To find out more about AnchorCert Gem Lab, SafeGuard, or SYNTHdetect please call 0121 236 6951 or visit website www.assayoffice.com. Sat 1st - The Friends will have a stall in Warstone Lane Cemetery. There will be free mini guided tours and the Friends can assist with looking up specific graves. Fri 7th/Sat 8th - Genealogy Show at NEC - Marie Haddleton managed to find a sponsor to enable the Friends to attend the Show and it is hoped it will help raise the awareness of the two Cemeteries, the people who lived and worked in the JQ as well as the present day people, and its museums. Our grateful thanks go to Marie and our sponsor. Sun 14th April, and 12th May Guided Tours of Key Hill Cemetery & Warstone Lane Cemetery. Just in time for International Women’s Day (8 March) Constance Naden's new gravestone is now in situ at Key Hill Cemetery. SIMPLY FIND JERRY IN THE QUARTER AND CLAIM YOUR FREE EASTER EGG. be made for the end consumer. This level of personalisation is designed to support retailers and jewellery businesses as they react to the increasing demands and bespoke requirements of their customers. Hockley Mint managing director, Gary Wroe, says: “Allowing our customers to access our diverse range of products and services online has always been a priority. This recent update of products and digital tools to the Hockley Mint website, our largest ever, makes ordering online easier and more useful for our trade customers. We encourage our customers, both long-standing and new, to access the website and see just how many products are now available to order.” In response to customer feedback, Hockley Mint has also simplified the process of signing-up to its website and creating an online account. Trade access requires unique log-in details, which can now be applied for, approved and delivered within 48-hours provided accurate information is supplied. Once registered, customers can swiftly access all of Hockley Mint’s digital services and comprehensive product offer priced for the trade. Hockley Mint will continue to focus on its digital presence in 2019, with on-going updates to its website and new products added as they are launched. To register, log-in or find out more about Hockley Mint, please visit hockleymint.co.uk. experience of Syriana even nicer, with a brand-new refurbishment. This is just the change we needed, and we can’t wait to welcome more people through our doors. The feedback has been astounding, we have loyal customers, who love our food and hospitality – and now our new look!” said Syriana’s owner. “Syriana frequently receives wonderful reviews on TripAdvisor, with compliments for great food together with good service. £5 million for a Hackney carriage support package; £2.75 million for a council-run Hackney carriage leasing scheme; £7 million for a private hire vehicle upgrade package; £10.05 million for an HGV and coach compliance fund; £0.35 million for suppor ting engagement and awareness activity, and £1.97 million to support the administrations of the above schemes and mitigations. The Jam House Team - Left to Right, Zack Booth, Patricia Sternak, John Bunce, Paul Roberts, and Adam Barrow. Selector. Predicted to be a sell-out, this show promises to be a big night! Other artistes featured in the Jam House anniversary year include Westlife’s Brian McFadden, 80's Superstar Alexander O’Neal, disco super-group Shalamar, and the Three Degrees. John Bunce, long-time Manager of the Jam House, says: “This 20-year milestone make us reflect on the all the good times. The great international stars - some boyhood heroes of mine - that we’ve met and worked with, the fantastically talented local musicians, the hard-working bar staff, waiters and chefs, and above all the customers that have made the Jam House the place that it is.” For the past twenty years, The Jam House has been at the forefront of the Midlands live music scene and continues to host an array of artists with a wide range of diversities and talents: from Gospel Central Choir, to supporting and nurturing local talent by hosting ‘The Acoustic Sessions’ (a monthly showcase of new talent and unsigned artists). You could have an advert in this magazine, all sizes to suit your budget. plating processes, and it was at Elkington’s large factory of 1838 on Newhall Street that the process was first commercially exploited... The electroplating process made possible the production of a huge variety of hard-wearing silver objects in great numbers and at a fraction of the price of the equivalent in sterling silver, thus bringing such items within reach of all but the poorest sections of society. Colin Giles, one of our most active researchers/historians in The Jewellery Quarter has researched and produced on behalf of The Friends of Key Hill Cemetery & Warstone Lane Cemetery, a comprehensive list of past Mayors and Lord Mayors who were buried in Key Hill Cemetery during the 19th Century, totalling fourteen! These included some names which will always be associated with Birmingham’s heritage, such as Thomas Avery, Joseph (& Richard) Chamberlain; Robert (& Thomas) Martineau; and Henry Manton. WW2 - From E.P.N.S. to P.I.A.T. David Hollander & Sons 124/8, Barr Street. The ‘Golden Triangle’ and the ‘Industrial Middle’ are the areas protected against inappropriate residential use. A large number of Planning Applications are not in accordance with the Planning Legislation which is there to ‘protect’ the Jewellery Quarter and the trade. Please help the Jewellery Quarter to keep its character by making your ‘official’ protest against such Applications. Planning Applications and Decisions for the Jewellery Quarter. Summary Guide to Use Classes A1 - Shops. A2 - Financial and Professional Services. A3 - Restaurants and Cafes. A4 - Drinking Establishments. A5 - Hot Food Takeaways. B1 (a) - Business. (b) - Research & development, studios, labs, high technology. (c) - Light Industry. B2 - General Industry. B3 - Storage/Distribution. C1 - Hotels C2 - Residential Institutions C2A - Secure Residential Institutions. C3 - Dwelling Houses D1 - Non-residential Institutions. D2 - Assembly/Leisure. You must register any objections to the above applications online at www. birmingham.gov.uk/planningonline, or writing direct to Planning and Regeneration, Birmingham City Council, 4th Floor, 1 Lancaster Circus, Birmingham B4 7DJ, quoting the Planning Application number. Remember, there is a restriction against inappropriate housing within the Golden Triangle and the Industrial Middle - but your objections still need to be recorded! HOW TO BOOK AN ADVERTISEMENT: Deadline 20th of the month preceding cover date for printed magazine. Place your advert online directly with PayPal or credit/debit card via PayPal. 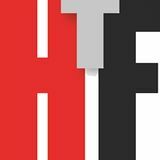 Visit www.thehockleyflyer.info and look for the classified page. Gemmology and Diamond Exam tuition Gem-A Gemmology (FGA) Diamond Diploma (DGA) • 18+ years’ Gem-A accredited tutor • More than 85% exam passes • Tution schedule to suit you! You could have an advert somewhere in this very magazine, all sizes and costs to suit your budget. THE MUSEUM of the Jewellery Quarter is built around a perfectly preserved jewellery workshop offering a unique glimpse of working life in Birmingham’s famous Jewellery Quarter. Open Tuesday to Saturday (and bank holiday Mondays) 10.30am - 4pm. Book tours online or call 0121 348 8263 (lines open Monday - Saturday 9am - 5pm). W: www.birminghammuseums.org.uk/jewellery. To apply send your CV and covering letter to penny.donnan@gemporia.com. The partners at Gemporia Limited take great pride in the fact that they are the UK’s largest retailer in loose and mounted genuine gemstones leading the way on TV and web sales. Deadline 20th of the month preceding cover date for printed magazine. Book on-line We know how important it is to recruit new or replacement staff quickly. Book your advert online yourself quickly and easily. Once payment has been approved the advert will be approved usually within hours. We will take the details from the advert and produce your advert for the next available printed version, or you can also supply your own artwork. Book off-line If you wish to place your advert without using our online service your advert will only appear in the printed version of the magazine. If you wish us to place the advert on-line as well an additional charge of £10 will apply for the extra work involved and extra details we require from you. Book on-line Our Business Page adverts are the most cost effective and easiest adverts available. From 3 to 12 months, and every size from 3cm x 1 column to 6cm x 2 columns, these can be booked online and pay at the same time for all insertions booked! You can also upload your artwork whilst ordering. Nearly all our Business Page advertisers opt for the 12 month option. Book off-line Send via email or post, but we do need payment for all insertions booked before accepting new adverts.